This past weekend, the Lampeter-Strasburg Guard had their second guard competition at Lower Dauphin High School. The weather did not cooperate as it stormed for a huge portion of the competition. The team's mat was wet from the water on the ground. Several members worried that they would slip. 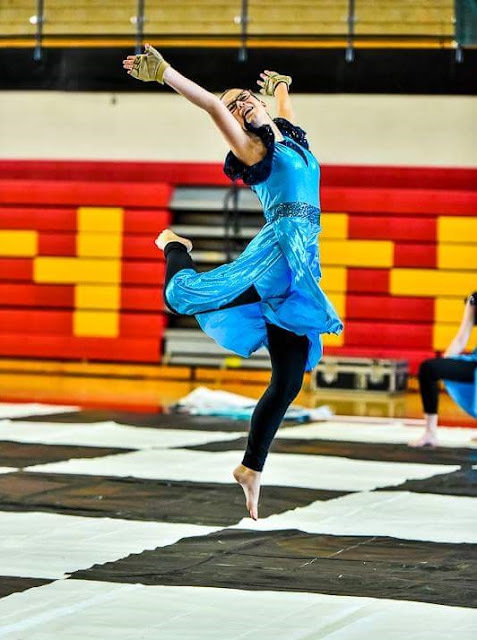 The guard also had a much better show than the Penncrest Competition. The entire team was satisfied with their performance although. Hannah Westerman knows that there are definitely a few areas where they can improve. Just days before the competition, the guard changed a huge section of their performance work. So the team was extra pleased to score so well despite the last minute changes. The guard nailed the ending. When the awards ceremony took place all the guards (and baton twirlers) walked out onto the floor. The MC began to announce team scores in the various divisions. It took a while for him to get to the L-S guard. L-S scored a 60.1 out of 100. The entire team was really proud of all their hard work. It was the best show of the season so far. There definitely a better mood in the van while driving home compared to last time. Everyone agreed that we had a good day with many accomplishments. Now we only have to keep working hard.